The Victoria Inn has a fresh feel and a real sense of place in the old seaside village of Perranuthnoe. Talented duo, Chef-Owner Nik Boyle and Head Chef David Waters, both grew up within five miles of this popular pub. Having both honed their crafts in Cornwall, they are fiercely passionate about what the county has to offer. Nik and his wife-to-be Laura took over the already successful Victoria inn six months ago to live the dream by the sea; Laura is originally from Hamble and also grew up by the sea. The chefs may be modest about their CVs and previous successes, but they are very proud of the pub classics on the menu, such as the Sunday roasts, cheaper less fashionable cuts of meat such as blade of beef and ox cheek. Nik says: “We are ‘old school’ in our style of cooking, with no foam guns or water baths in the kitchen. We love the flavour you get from roasting lamb and beef in the oven or basting sea bass with foaming butter and just doing things simply and doing them well.” There is, however, certain sophistication and fresh feel to the food; it’s light, fresh and above all very, very tasty! 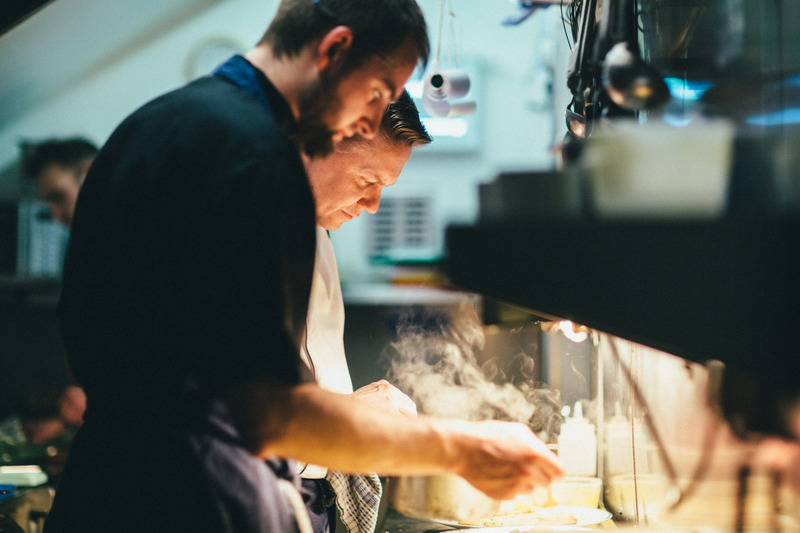 Being a local lad has its advantages, as both chefs are on first-name terms with local producers: there are superb daily catches from fisherman Budgie’s day boat; beef is from a herd in Zennor; Rita up the road supplies fresh eggs. The vegetables come from two miles away. “When our local grower can’t fit the cauliflowers eight in a crate for the supermarkets, we get the big ones – they are like footballs,” Nik adds. You can feel that old and new come together in perfect harmony at the twelfth century Victoria Inn with great food and traditional family values.